The Civilian Conservation Corps (CCC) in South Dakota had over 50 camps and side camps. Over 30,000 men served in the South Dakota corps between 1933 and 1942. If you have questions, comments, corrections, or information regarding the South Dakota CCC, Please Contact Us. . . . . more 1 mi from Chamberlain, South Dakota. . . . . more near Interior, SD south of Cedar Pass. 1935, 10/31 - 1936, Spr, Headquarters Co.
. . . . more The camp was located on the state fairgrounds on the west edge of Huron. . . . . more 9 mi W of Custer and approx. 4 miles east of Jewel Cave National Monument. . . . . more Camp Narrows was located in Custer State Park. . . . . more Camp SP-1 was located 1 mile west and 1 mile north of Mount Rushmore, among the pine-covered hills of Pine Creek Canyon. . . . . more Camp Summit Peak was 24 mi NE of Newcastle, WY. . . . . more Camp Tigerville was located approximately 8 miles NW from Hill City, SD on Deerfield Road. This "CCC" project is part of a larger one that will undoubtedly never be completed. 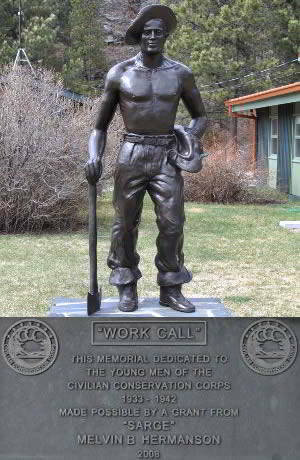 Some 23,000 plus workers served in the Civilian Conservation Corps (CCC) in South Dakota. This project core has been adopted from the project started by Otto Bochman utilizing several sources and visiting the majority of CCC campsites. Early on Peggy Sanders shared information that she had gathered. Her extensive work on the CCC, her book(s) and her contribution to the Museum in Hill City have been most important in reaching this point in our project. Lyle Derschied's "The Civilian Conservation Corps in South Dakota, 1933-1942" was an invaluable resource. Derschied, Lyle A. "The Civilian Conservation Corps in South Dakota, 1933-1942." Brookings, SD, South Dakota State University Foundation Press, 1986. No longer in print. Available at some libraries but may not be checked-out.